Giving feedback to employees is an essential part of management communication. Feedback promotes professional growth and skills mastery among your workforce. It can also inspire confidence and instill a greater sense of job satisfaction in the workplace. If asked, most people will admit they crave feedback on their performance, particularly millennial employees. Unfortunately, most managers fall short in the amount of feedback they provide. Ironically enough, the research shows that 58% of managers think they give enough feedback. So, how can something as fundamental as giving feedback to employees be routinely disregarded or simply deemed too inconsequential for most managers to proactively address in the workplace? It’s easy to overlook the value of feedback. When you’re busy, scheduling one-on-one meetings with each of your employees can seem like an unproductive use of your already limited time. However, it’s often the lack of employee feedback that can lead to the loss of productivity. In fact, one Gallup study suggests that a startling 70% of workers report feel they’re not getting enough face-to-face interaction with their bosses and are no longer showing up to the office committed to doing their best work. Gallup estimates that these actively disengaged employees may cost the United States upwards of $550 billion in lost productivity every year. Such a scenario can wreak havoc in the workplace—from employees missing work days and being a negative influence on co-workers to potentially driving your best customers away. Knowing how to give feedback is obviously a critical aspect of the job role for any manager, supervisor, or HR professional. But what can you do to best ensure your employees are realizing their full potential, feel actively engaged, and strive to improve their performance? In this article, we will explore three ways you can become more effective at giving and receiving feedback. These strategies can also help you develop more meaningful work relationships while encouraging your direct reports to enjoy a more profound connection to their workplace. When you learn how to give positive feedback, you can have a greater influence on your organization. Sound promising? Let’s get started. Giving feedback to employees can be intimidating or even scary. After all, feedback can be a not-so-subtle suggestion that an employee needs to adapt in their role or step up their job performance to better meet the growing demands of the organization. In some situations, those receiving feedback can feel a sense of fear, shame, or even anger. But imagine how things could play out without the presence of honest and critical feedback. Without proper guidance or course adjustment, any one of us could quickly stagnate in our job roles. Become complacent and unmotivated. Feel unchallenged. Or risk losing our jobs entirely. In her international bestseller, Radical Candor, author and former Silicon Valley executive Kim Scott emphasizes that people leaders should aspire to “care personally and challenge directly” when giving feedback. At its core, this means having real conversations with your employees. From her own trials and errors in trying to be a “good boss,” Scott stumbled upon on a paradox; most people prefer the challenging jerk to the boss whose “niceness” gets in the way of candor. Fortunately, being a good boss doesn’t mean choosing from either of these extremes. However, Scott’s further observations do suggest that it is “kinder in the long run to be direct,” even if by articulating criticism in such a manner will cause some momentary upset. Too often, the fear of being too mean leads most of us to offer disingenuous or insincere praise rather than critique. The hallmark of any real conversation is being honest and specific in both praise and critique. That is the purpose of feedback. Challenge the behavior that needs correction. Be upfront about what it might take to improve the behavior. If you’re being honest in giving and receiving feedback, don’t worry how you will be perceived—it makes you less willing to say what needs to be said. If you’re addressing a difficult situation while giving feedback, trying to defuse the moment by saying things like “Don’t take it personally” are actually counterproductive. Your employees are entitled to their feelings. If necessary, give them time to absorb your feedback and compose themselves. Then, simply follow up and continue the conversation. Remember, letting poor performance slide simply to avoid tension at work can ruin an employee’s chance of success or handicap the entire team. Giving feedback to employees should not be limited to the annual performance review. Too often, we leave annual performance reviews fully engaged and ready to act. We start out strong with our employee development plans that first week. Yet, without regular check-ins to measure the progress of those initiatives, we revert back to old patterns in the next few weeks. Consistent feedback is an essential aspect of the learning and development of your employees. As a supervisor or HR professional, the daily interactions and personal exchanges you have with your employees can have an enormous impact on their career growth and job satisfaction. For the millennial generation, job-hopping is all too common. Given that millennials are set to comprise up to 75% of the workforce by 2025, this phenomenon has a lasting financial impact since the replacement cost of an employee can be as much as 150% of his or her annual salary. According to the report How Millennials Want to Work and Live, 60% of millennial workers are open to different job opportunities right now, with just 50% who plan to be with their company one year from now. Why are millennials such a flight risk? One reason is that many of them don’t feel comfortable approaching their managers with concerns about work or initiating the important conversations about their development or taking on additional responsibilities. This is why it’s so critical to make the effort to personally connect with your entire team. Giving and receiving feedback is a priority that will require commitment on your behalf as a manager. When formulating how to give feedback, make a point of investing enough time to understand the subtle nuances of your employees. Determine how they are progressing week-to-week by scheduling follow-up meetings on a consistent basis. Doing so not only helps you adjust your coaching methods on how to give feedback for employees, but it also helps keep them active and engaged in the process of giving and receiving feedback. By maintaining a regular conversation with each of your employees, you encourage continuous development for the team—as well as your entire department or organization. Don’t limit these follow-up meetings to just work-related discussions. When you pay attention and take time to also talk about personal matters, it helps to establish a more supportive work environment. Your best-intentioned feedback won’t matter much in the long run if it’s not actionable. When your praise is non-specific and doesn’t actively encourage an employee to build upon what they are doing right, it becomes trite and patronizing rather than helpful. In contrast, criticism that focuses on ultimatums or threats instead of skill development or coachable behaviors only fosters frustration and discouragement rather than measurable progress. Knowing how to give feedback that is actionable for your employees requires additional insight. 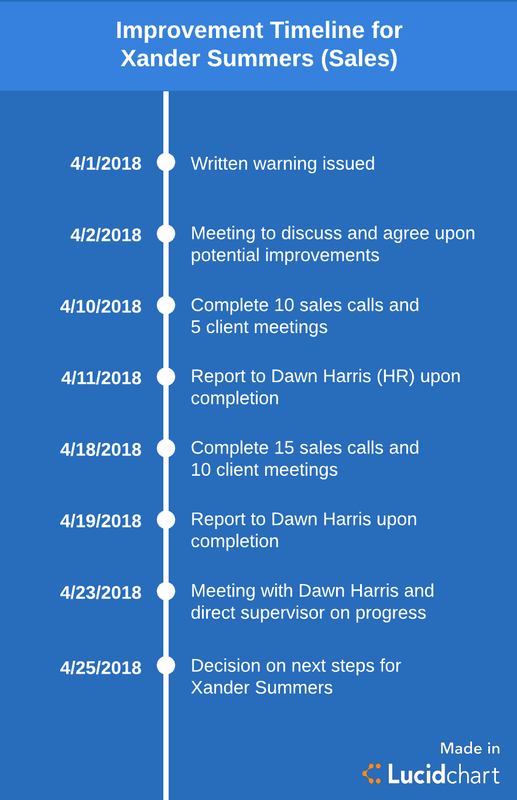 Make note of the specific conversations you’ve had and the steps you’ve taken every week to coach or provide support during your follow-up meetings. When determining how to give feedback with greater impact, consider how each employee has responded to your coaching efforts thus far. Have they followed your advice? Has your recognition garnered results? To ensure your feedback is actionable and well understood by your direct reports, consider using a visual outline with all the relevant details to better clarify what actions are expected. To keep you on the same page as your employees, Lucidchart offers a variety of templates to help organize your feedback into an easy-to-follow flowchart. For example, consider our SMART goals template. Based on the SMART goals method to identify goals as Specific, Measurable, Attainable, Relevant, or Time-bound, this template can deliver the structure needed to turn aspirations into actionable-objectives with the clarity to see what progress has been made. The SMART goals method also provides you with a consistent approach to putting feedback into action with each member of your team. By using the flowchart as a reference tool, you have a visual conversation starter for each follow-up conversation throughout the feedback process. Of course, when it comes to providing actionable feedback, you shouldn’t feel restricted to the SMART goals method. As far as feedback styles go, any methodology that allows you to break down your employees’ goals or areas for improvement into achievable steps with trackable progress is worth consideration. Giving and receiving feedback is always an ongoing process. With Lucidchart, you always have the capability to customize templates to meet the requirements of your organization’s performance review or employee feedback needs. The ability to provide effective feedback is an essential managerial skill. 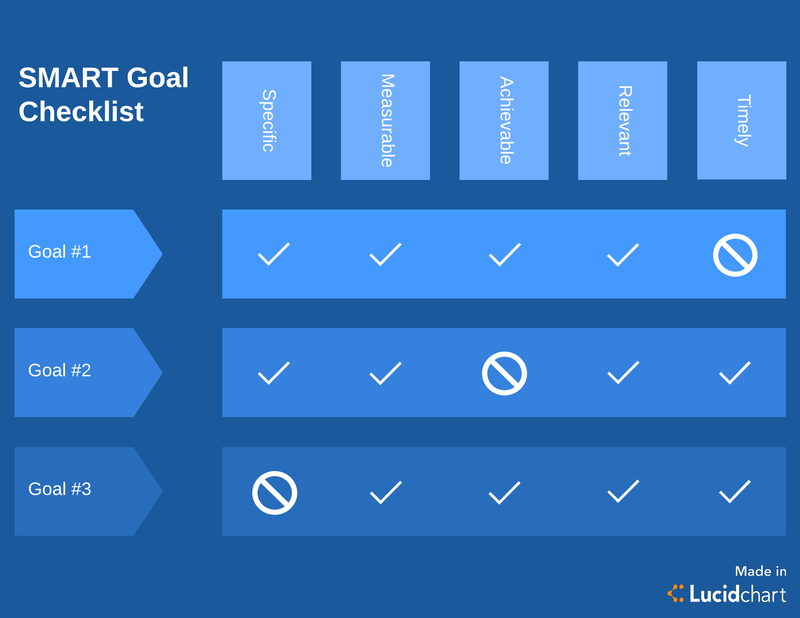 Whether you choose to map out the skills that need improvement or develop a timeline for tracking the achievement of their goals, Lucidchart has the tools and resources you need to put your plan into action.